> 555 Heritage returns to Wales Rally GB !! Thread: 555 Heritage returns to Wales Rally GB !! Subaru can go back to the future ...albeit 1995 !! The 20th anniversary of Colin McRae's World Rally Championship title will be celebrated with a boxer engine and an iconic colour scheme at next month's Wales Rally GB. Subaru USA has purchased a Group N Subaru Impreza WRX for its seven-time American champion, Brit David Higgins to drive in the Scottish superstar's memory. While Higgins will not be able to challenge for overall honours in the car, he will be out to rekindle memories of a hard-charging McRae on an event he made his own - and won Britain's first ever World Rally Championship on in 1995. "It's fantastic to be coming back with this car," Higgins told Autosport. "There's definitely going to be a lot of emotion around when people see the car - it's such a special livery. "I drove one of Colin's World Rally Cars at Rallyday not long ago and when I got out of it, there was definitely a lump in my throat. It's going to be the same with this car. "What we have here is a fantastic opportunity to remind people just how big Colin was and still is. "It's also really important to remember how important Colin and Derek [Ringer, co-driver] winning the world championship was for British rallying. "It put us on the map and helped give younger drivers an opportunity; I benefitted from their success and I'm sure British drivers still are now. "But above all of that, what we've got is a really cool car that sounds perfect and coming in the right colours. "I can't wait to get it in the woods and give it my best to represent Colin's memory." Higgins, who will be co-driven by Craig Drew, has not competed on his home WRC round since 2008, instead focusing his efforts stateside. He has won the last five Rally America titles back-to-back and victory on the Lake Superior Performance Rally in Michigan sealed the perfect season for the Manxman. But he now turns his attention to Rally GB and memories of 1995. "I was doing the RAC in 1995," said Higgins. "I won my class in a Honda Civic. It's hard to believe it's 20 years ago and it's really hard to believe that 1995 was Colin's only title. "When we celebrated in Chester, that was supposed to be the first of many." Higgins is already looking towards the potential for upsetting a few of the R5 runners in Wales next month. "It'll be interesting to see what we can do and how far up among the R5 cars we can get," he said. "I've been around these stages for a very long time, so I've got a fair idea of what to expect. "The first day goes right through the village where I live, which will be a bit weird. "But it'll be special to look in the mirror and see that blue and yellow..."
The car is being built and liveried by Daventry-based preparation firm JRM. These are the first pictures of the Subaru rally car that will be the focal point of celebrations to mark the 20th anniversary of Colin McRae’s FIA World Rally Championship title success at Wales Rally GB this weekend. The NR4-specification Subaru WRX STI has been entered by Subaru of America and will carry a distinctive livery that is reminiscent of the blue and yellow colours that adorned McRae’s title-winning Subaru two decades ago. The car has been built by British preparation specialist, JRM, and is the newest production rally car in the world. It will be driven by seven-time Rally America Champion David Higgins this weekend and he tested the car in mid-Wales this morning as part of Subaru of America’s pre-event countdown. 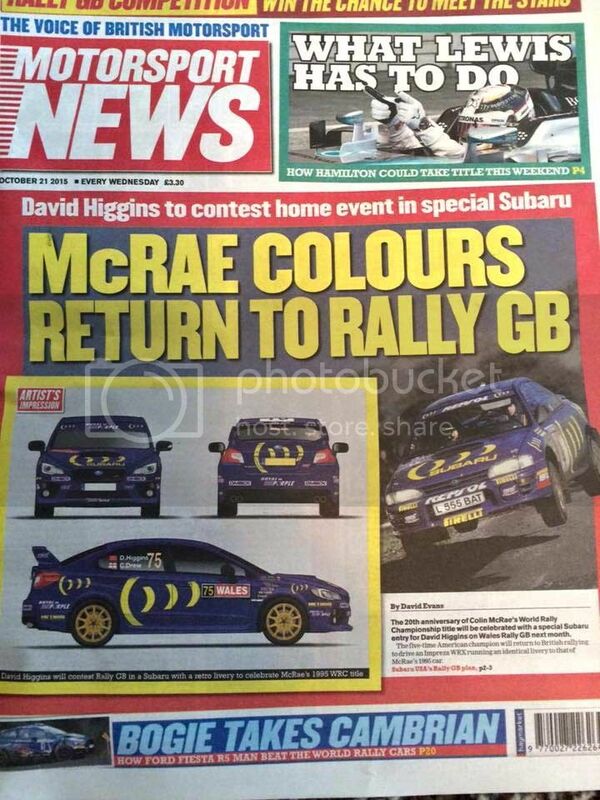 “It definitely brought a lump to my throat to see the car in its blue and yellow livery and I’m sure it will be pretty emotional when Jimmy (McRae, Colin’s father) waves us across the start ramp on Thursday,” Higgins said. Higgins is aware that seeing his Subaru at Wales Rally GB will be a poignant moment for many spectators on the Welsh stages and he’s vowed to entertain in a way that McRae would have approved of. “I’m going to be very, very clean and tidy on the secluded parts of the stages but when we see the fans we’re definitely going to have to be a bit more spectacular,” he added. Tax Returns. What you going to buy with it?